With this plugin you can add easy to setup newsletter subscription form that can save subscribers information into database, and send subscription information to one of supported online newsletter services or plugins. You can add more than one form in the same time, and each form added can use different styling, settings, subscription service and list. If you use some other online service other than services directly supported by this plugin, you can still use this plugin, and you can export lists with subscribers manually into CSV file. 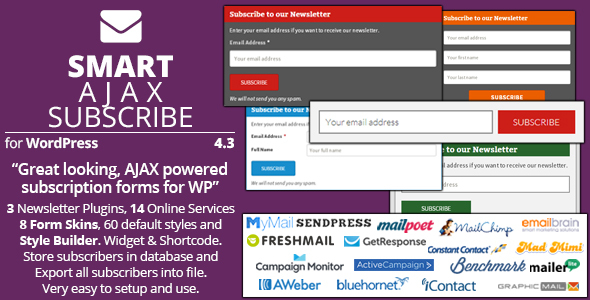 MyMail, MailPoet and SendPress plugins for WordPress newsletters and 14 popular online newsletters services are directly supported (different methods to connect to API’s for these services). You can use multiple lists from each supported service. Forms use AJAX to send data to server for processing. You can customize form elements, text used for labels and messages for the form, layout and other elements. You can add more then one form through widget, shortcodes or functions. Plugin adds new table into database for storing subscribers data. You can filter this list, and export subscribers information into CSV file for later import into newsletter service website. If you use one of directly supported newsletter services, plugin will send subscribers information directly to service and list you can specify for each form you add. Plugin comes with more than 60 default color styles for the form. They are based on 8 different skins. Additionally, you can change layout elements (labels, alignment, placeholders in fields) to get form layout the way you need it. Start with blank style or duplicate one of the default styles to create your own style with any of 8 available form skins. Use easy to use color pickers, styles real time preview and possibility to add custom CSS to make styles that will best fit your theme. To make integration process easier, plugin can help you generate shortcode (for post/page content) or function (for direct theme template integration) based on the settings you can change. Includes email notification system to inform admin about new subscribers. Includes two antispam methods to minimize spam subscription requests. Includes PDF user and developer guide with file with database table schema. Integrate with WordPress comments or registration forms, bbPress topics nd replies forms and forms in many other plugins and show checkboxes for subscribing to different newsletter lists. Plugin contains PDF user guide in the plugin package, inside the ‘docs’ directory. Check out this user guide to get information on plugin options, usage and more.